Needing Fast Relief From The Stress And Damage Caused By A Flood In Your Home? Feel great about getting the same powerful solution as a professional mold remediation company without the HUGE bill! Works effectively to fight mold both inside or outside of the home. Peace of mind knowing that Flood RX produces no odor or harmful fumes! Time is critical after a flood, clean up needs to start immediately. Mold and other dangerous toxins begin to grow as soon as the water shows up so when the water is gone it's time to grab a bottle of Flood Rx and start cleaning. Flood Rx can be used inside or outside of the home to fight mold. Flood Rx can be used on any surface without worry of staining. Flood Rx has no odors or harmful fumes making it very safe to clean with inside in non-ventilated areas. Every 2 lbs of Flood Rx will make 8 gallons. Mix the Flood Rx with water, apply it to any surface and wipe the mold goodbye. Apply Flood Rx to a moldy carpet, let it soak for 30- 60 minutes and with a wet vac, vacuum it up. Soak clothes or linens in a washer machine or another large container with a cup or 2 of Flood Rx for 2-3 hours then wash normally and watch the clothes come out clean. What's wrong with just using bleach to clean up after a flood? Until now a product like Flood RX was only available to professional mold remediation companies. Homeowners were armed with a bottle of bleach and a sponge. The trouble with bleach is that it's not designed to clean porous surfaces, it works great on a counter top, that is flat and without pours. What's missing is the right surfactants and wetting agents to drop the cleaning agent into the groves and crevices where the mold spores are hiding and multiplying. The next big problem with bleach is that it stains everything so you are limited to what can be cleaned. Let's not forget the awful odor and the eye burning fumes. Wouldn't it be easier if Flood RX was produced as a liquid rather than a powder? 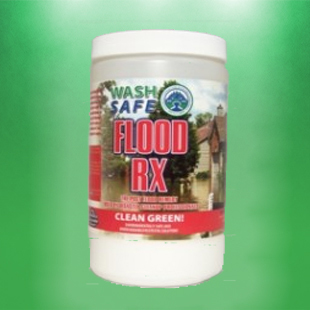 Flood Rx is a very strong powder concentrate that can be mixed with water and is ready to clean. it is not necessary to add chlorine bleach. The reason we made the Flood Rx in a powder is because when you add the water to the powder you have 100% cleaning strength. When you purchase a liquid cleaning product like chlorine bleach or something that you may buy at the big box stores, it is not full strength, it was only full strength the first few days after it was mixed and every day that passes the product gets weaker and weaker. Liquid cleaning products have a active shelf life of 12-18 months and people wonder why cleaning agents from the big boxes stores don't work that well? they were probably a good product at one point of it's life but not by the time we purchase it. So the moral of the story is when you have a chance to buy a powder product, do so, they are much stronger. Severe floods can displace an entire family, a neighborhood, town or city for days if not weeks. We released this product to the "homeowner market" after the deadly 2011 Tennessee floods, we felt everybody, not just professional cleaning contractors could benefit from the use of our Flood Rx because as we stated earlier, time is of the essence and we hope that homes were able to be cleaned and moved back into sooner and families reunited.